Colin questions Scarlett about whether she always does that with the veg, and why did she put certain colours together? Vermeer likes her answers and hires her on the spot. 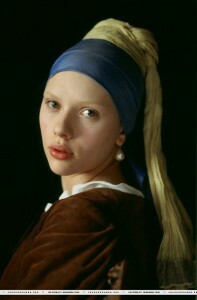 Because of her artistic sensibilities she becomes his aide and eventually models for the mysterious Girl With a Pearl Earring portrait. I love the idea that a simple girl’s artistic talent can lead to her being plucked from obscurity by a genius. (We’ll skip the scene where he jams one of his wife’s earrings into Scarlett’s earlobe. It’s a bit nasty and symbolic.) So why is it then, that when I hang out the laundry and peg pairs of socks next to each other, rather than at random, I get accused of ‘being a bit OCD’? Colin didn’t say to Scarlett, ‘That’s a bit OCD.’ I haven’t got a problem. I don’t get hugely upset and highly anxious if the socks are mixed up. I don’t suffer from bouts of paranoia or feel that something terrible will happen to me or my family if the socks just aren’t exactly right. That might be a sign of OCD: Obsessive Compulsive Disorder. Here’s another one: ’He’s a bit on the spectrum’. Why? Because he likes to have everything tidy on his desk so he knows exactly where to find things. And he’s the same with his car keys and his wallet and his slippers. No I’m sorry. He is not showing signs of autism. He’s just a bit particular where things go, so that he won’t waste time searching for stuff when he needs it. Granted people might think you are a bit childish if you walk down the street and see four red cars in a row and think, ‘It’s going to be a good day today.’ That’s like children not walking on the cracks between paving slabs in case the witch gets them. But some adults get a bit worried if they only see one magpie, or will never walk under a ladder. That’s called superstition. If you get highly agitated when you see three cars in a row that are of different colours, and you can’t make eye contact, and you don’t understand why people need to talk to communicate and you have certain highly elaborate rituals and you have a history of very high anxiety about doing apparently trivial things and you are highly sensitive in all your senses and you are totally obsessed with car number plates… then you actually might be on the autistic spectrum. Am I just being a bit over-sensitive about the socks thing? Well maybe, but I do think it’s important to describe people correctly, and especially children. If labels are used often enough, then they stick, and they can become part of a child’s self-image. If a child is completely silent in preschool, but can talk to her mum at the end of the session, should we describe her as ‘an elective mute’? Because if we do that, we are suggesting that this little girl is electing or choosing to be silent. Then we might be able to justify why some colleagues are describing her as stubborn, manipulative or controlling; none of which are true (she’s only three and a half after all.) It’s very possible that the little girl is shy. But we need to be accurate about that that term too. It’s not a question of me being picky about words (or even a bit OCD?). When we are talking with parents about concerns we have about their child’s behaviour and communication, it’s very important to use the right words. In our book ‘Supporting Quiet Children’, Maggie Johnson and I suggest using positive language to describe children; particularly when we are discussing difficulties. So instead of saying ‘Jessica rarely plays anywhere other than the home corner’ we can say, ‘Jessica particularly enjoys playing in the home corner, and we are supporting her to play in other areas.’ Or avoid saying of a silent child, ‘She won’t talk in school’. It’s much more positive and accurate to say, ‘Katja talks confidently at home and we are helping her develop her confidence in school.’ It’s not just playing with words, but giving a positive message about what adults intend to do to support the children who are experiencing difficulties. And what about Colin’s portrayal of Vermeer? You could say, ‘Well I thought his use of the pigments lapis lazuli and natural ultramarine were excessive and quite frankly his application of a thin, off-white scumble of paint over the brown shadow of the girl’s neck , which was meant to define the pearl , was clumsy. I agree that it is painted more opaquely at the bottom where the pearl reflects the white collar, but you can even see hairs from Colin’s brush in the half-tones of the flesh areas.’ But people just might think you were being a bit OCD. 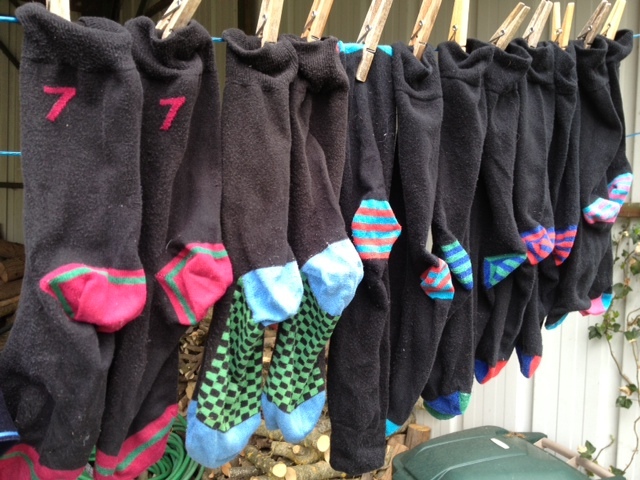 Here’s a final thought: if Colin Firth, or even Scarlett, came round your house and offered to help you out with the laundry, would you check with them first if they were going to peg out the socks in the right order? 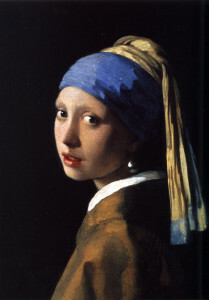 Girl With a Pearl Earring by Tracy Chevalier is published by Harper Collins. Michael led the Every Child a Talker (ECaT) project in three different parts of England, and has a particular interest in supporting children who are very quiet. Oh dear, I always peg out the socks in pairs, my husband doesn’t. I think I’m just normal and that he is totally disorganised. He does waste an awful lot of his time searching for things. And I waste an awful lot of my time searching for his things too. Who needs the label here? Seriously though, what do you think about the labels we attach to children? I have been labeled as “quiet” both as a child and as an adult. As a child, that label caused me to withdraw into myself even further. My teachers expected me to be quiet — so I was. I was also overlooked by my teachers. My needs were unmet because I never vocalized them and they never asked. I have listened to children being labeled by their teachers as “biters.” Is it any wonder that the frequency of the biting increases? Teachers need to understand why children bite before they can implement strategies to prevent the biting from continuing. Teachers also need to learn strategies for supporting children who choose not to speak in class. Every child has a name and that name should be the only “label” that teachers apply to them.